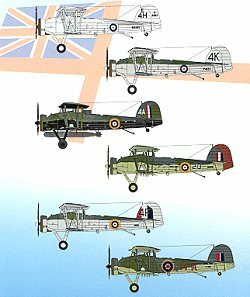 Now that modelers finally have a decent 1/48 Swordfish, Aeromaster was quick to release several sheets for this aircraft. 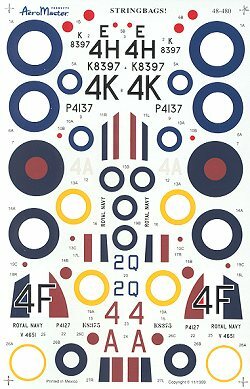 Their first is this sheet for Mk I aircraft from 1939-1943. All are wheeled versions and in a variety of color schemes. First scheme is for an 813 Sq aircraft from the Eagle in the Indian Ocean in Sept 1939. This one is grey on metal surfaces and aluminum dope on fabric ones. Next is once from 820 Sq, Ark Royal, Egypt, April 1940. This aircraft was part of the raid on Oran to sink French battleships. It is in Dark Sea Grey/Light Slate Grey with Sky Grey lower surfaces. An 815 Sq Swordfish from the Illustrious and the Taranto attack of November 1940 is next. This one has the Sky Grey undersurfaces painted black for this famous night raid. 810 Sq aircraft from Jamaica, Oct 1941 This one carries a sky lower surface and was aboard the Ark Royal during it's attack against the Bismark in May of 1941. The next Stringbag is an 820 Sq aircraft again from the Ark Royal during attacks on Sardinia in the Med during August 1940 This one has the Sky Grey undersurfaces. Finally, and 813 Sq aircraft from Gibralter in 1943. This aircraft was used for anti-submarine patrols across the straights at night in an effort to prevent German submarines from accessing the Med. All in all, a worthwhile sheet that will be sure to enhance your Tamiya Swordfish.